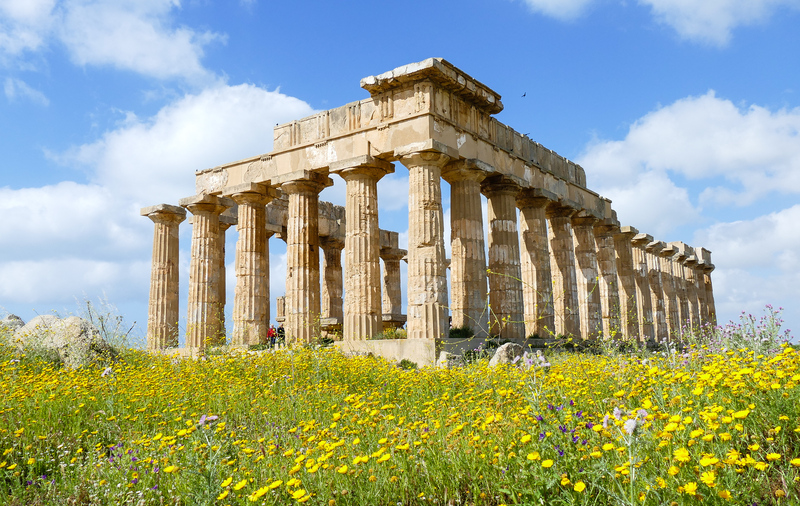 03.06.2019: Imagine columns from the ruins of a Greek temple standing amid fields of wildflowers on a perfect spring day. 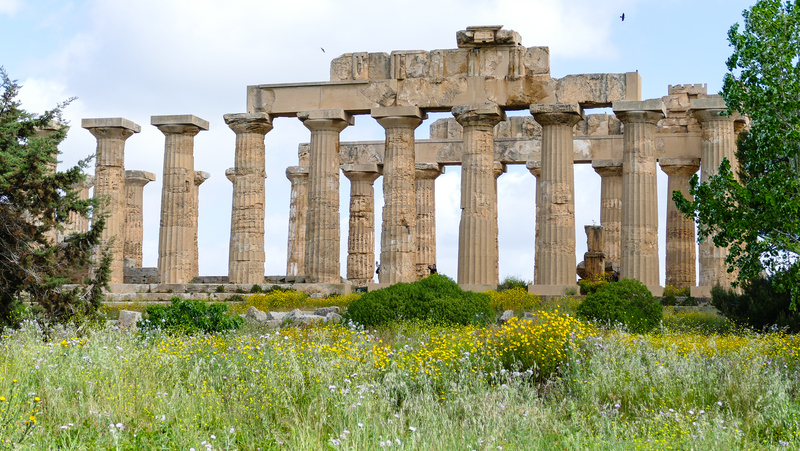 When Alan and I traveled to Selinunte, Sicily, on a spring cruise with Silversea, that’s exactly what we found. And it was a beautiful reminder that the most magical of travel experiences happen when we least expect them. Temple C, or the Temple of Hera, at Selinunte Acrhaeological Park in Sicily. This wonderful experience almost didn’t happen. The number of guests signed up for the Ancient Greek Ruins of Selinunte excursion didn’t meet the 12-guest threshold for running a tour. When the Silver Wind tour desk realizes that all other choices are full, they operate the excursion anyway rather than disappointing the ten of us who have signed up. That’s the beauty of small ship luxury cruises. We board a comfortable, uncrowded air-conditioned van portside for the hour-long ride to Parco Archeologica Selinunte. 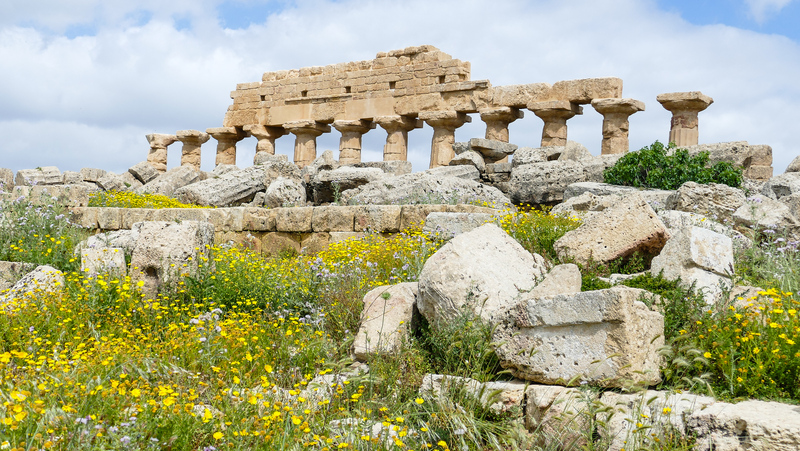 Local guide, Elena, tells us about the region as the van drives through the port town of Trapani and into the countryside on Sicily’s west coast. Pointing to Erice, the hilltop town where many of Silversea’s guests are spending the morning, Elena remarks that their shore excursion will be far different from ours. The medieval city is shrouded in clouds. Perhaps our group of ten has made the best choice after all. Arriving at Selinunte Archaeological Park, everyone has the opportunity for a comfort stop before beginning the tour. Then Elena leads us toward the park entrance, pausing to explain the posters of artifacts plastered to the wall. The items were found in the ruins but most now reside in the Selinunte room of the Palermo Museo Archeologico. All we will see at the actual site of Selinunte are the physical remains of stone temples, city streets and rampart walls. Our first look at Temple E, the most impressive ruin in Selinunte. The magic begins immediately after Elena purchases entrance tickets. Approaching the three temples ruins that stand on the East Hill; Alan and I have a dilemma. Should we photograph the ruins of Temple E punctuated by a bluebird sky first or concentrate on yellow and purple wildflowers accenting centuries of history? We snap away as quickly as our fingers can click the shutter button. Inside the Temple of Hera. And, of course, we want to listen to Elena’s expert commentary. She leads us up the steps of Temple E—Temple of Hera—for a closer look at the partially reconstructed ruin. The structure honors Hera, wife and sister of Zeus, and the Goddess of Women and Marriage. Columns and stone blocks litter the ground, waiting to be reassembled into their former glory. In ancient times, much of Selinunte was destroyed by war—10,000 Carthaginians laid waste to the Greek colony city in 409 B.C. And then there are the earthquakes, which have rocked Sicily through the centuries. That’s why most of the temples and buildings are nothing more than a jumble of unattached columns and huge building blocks of stone. 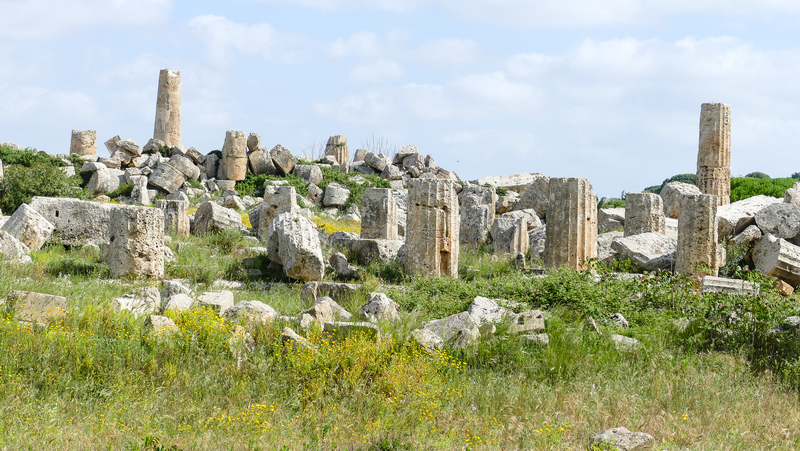 Like many archaeological sites in the modern world, most of Selinunte still lies beneath the grasses and wildflowers, waiting to be discovered. 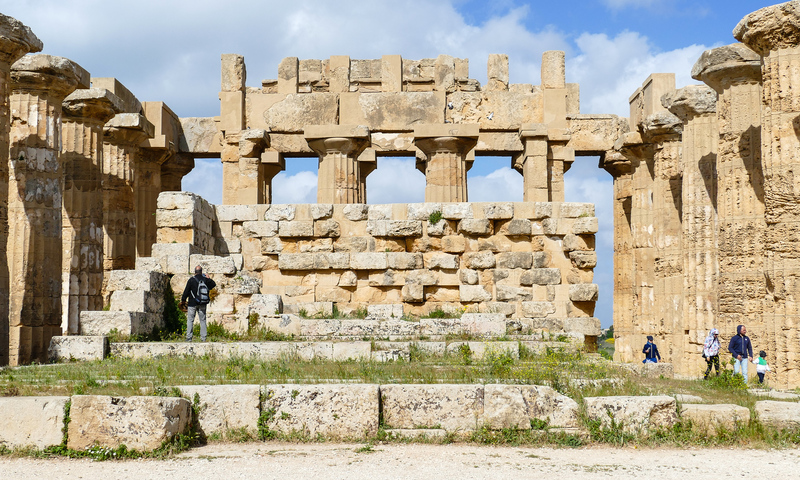 A visitor adds scale to the immense columns and stone blocks at Selinunte. After exploring the three temples on the East Hill, the group returns to the van for the short drive (it could have been easily walked on a longer visit) to the ruins of the fortified city (acropolis), which overlooks the Mediterranean Sea. Yes, that’s a Carthaginian bathtub. 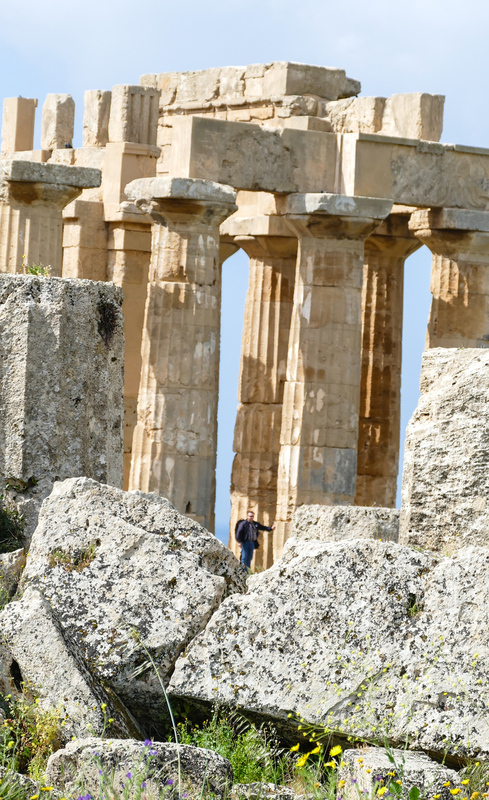 Rather than temple gazing, we explore everyday life in the ancient Greek city. Elena points out the avenues of the commercial and residential districts. 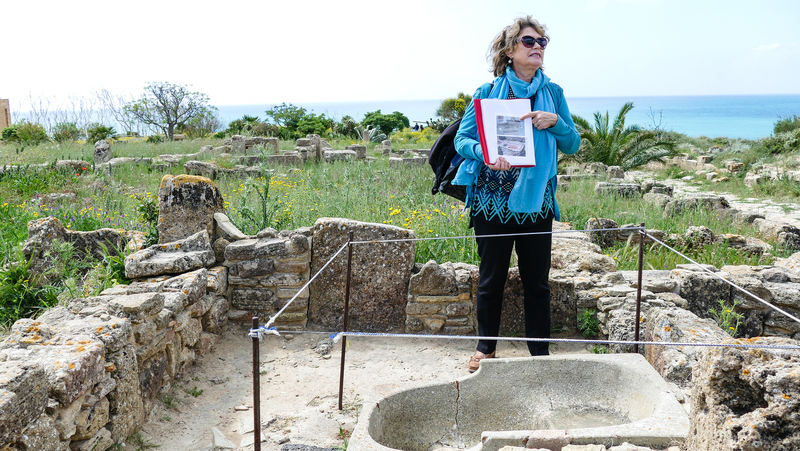 In one house, she shows us how the Carthaginians used a bathtub. As Elena holds up a portfolio of photos and charts to help us better understand, I am reminded how much a knowledgeable guide adds to an experience. Only a small portion of the Temple of Apollo remains standing. Standing at the restored base of Temple C, dedicated to Apollo, I revisit my freshman college class, the History of Western Civilization. The lessons I learned of Greek and Roman gods are all but gone. And those names—Phoenicians, Carthaginians—keep circling my brain trying to unsuccessfully attach themselves to a snippet of memory. If you’re curious about history’s timeline in Selinunte, read this article by Jeremy Dummett, Trinity College, Cambridge. Or if you’re looking for an extremely simplified way to think of things, according to Elena, the Canaanites became the Phoenicians became the Carthaginians became the Punics. After touring Selinunte, we make an unscheduled, but welcomed, stop at a gourmet shop to taste Sicilian wine, olives and cheese. This has been one of the most enjoyable cruise excursions we’ve experienced in a long time. Hopefully Silversea and other cruise lines will keep it on the itinerary when ships visit Trapani. Planning a cruise in the Mediterranean? You’ll want to check out our Mediterranean cruise excursion reviews.